The BOM to Microsoft Excel plugin is run by DriveWorks during the model generation process. It traverses the SOLIDWORKS assembly of a newly generated clone (regardless of whether the components are captured by DriveWorks or not) to retrieve the BOM information (Assembly Structure and Properties) and inserts the data into a new Excel file (based on a template) and saves the file in the Assemblies folder. This plugin will only run when using Queued Model Generation (Manual or Automatic). Please see Model Generation Behaviour for information on Queued Model Generation. This plugin can either be used in DriveWorks Administrator (In which case it will run as part of the DriveWorks Addin inside SOLIDWORKS during model generation) or added in to DriveWorks Autopilot to run as part of the Autopilot function. If you wish to use this plugin from the DriveWorks addin inside SOLIDWORKS, then you will need to ensure that the plugin version is matched to the exact version of DriveWorks that you are using. To make sure that the versions are matched, right click on the file DriveWorks.Engine.dll that comes with the plugin, and check its version number against the version that appears on the bottom right of DriveWorks Administrator. The installation file is available from the DriveWorks User Community web site at https://hub.driveworks.co.uk/ (login required). Once downloaded double click the DriveWorksLabsBillOfMaterialsToExcel.msi file to begin the installation process. DriveWorks and SOLIDWORKS should be closed while installing the plugin. The plugin is uninstalled from Windows Programs and Features, and will be listed as DriveWorks Bill Of Materials Excel (Database). A settings file must be loaded to use the plugin. Click this button to either browse to an existing settings file or create a new one in the desired location by just typing a filename in to the browse window. Once the plugin has been configured, this settings file can then be transferred to any other machine that wishes to use the plugin. The plugin needs to know the name of each assembly it is to run on. This is the Master Model Name of any captured DriveWorks model minus the extension, and is case sensitive. Click Add after each master assembly name that is added. Click Delete to remove the model. 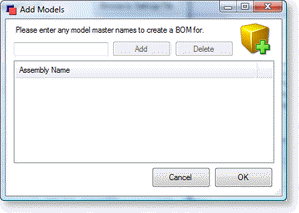 The plugin allows for different options and BOM Templates to be configured for each master model that can be generated from the DriveWorks group. Once a Model has been selected in the Project List drop down, the rest of the settings can be configured. Check the box next to each option required for the selected model. This includes the top level assembly in the BOM. This will resize columns to fit the largest text string within a column. This will place Instances of the same component that use different configurations as a separate item in the BOM. This will include identical components that have different parents as a separate item in the BOM. 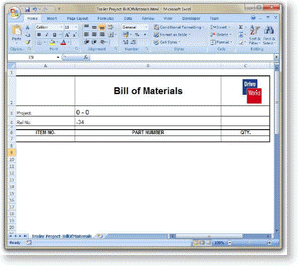 The plugin requires an Excel template to export the BOM into. The template is created using Microsoft Excel, and must be .xls or .xlsx format. Typically the template will include an area (Header) for the document title and company logo. This area can be ignored by the plugin by selecting the row number to start importing the BOM items. The template may also include header information (Project Number, Date Created etc.). This information is driven by naming the cell in the Excel workbook and then mapping this to a SOLIDWORKS custom property in the top level assembly being driven. The workbook will open automatically to help with the setting of the other options available. Select the row number to start the import to. This must avoid the rows included for the header and the header information. 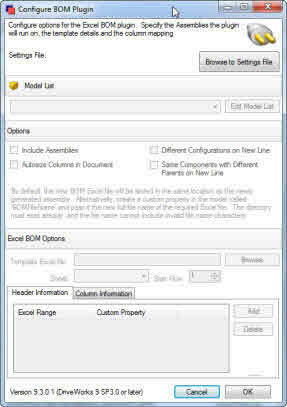 The header information should be placed at the top of the Worksheet, and is there to send values for the BOM as a whole. If a cell has been named in the excel BOM Template, then a custom property for the assembly being exported can be driven directly into that cell. 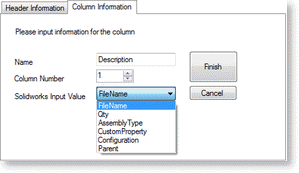 Column Information is where all of the details required for each item in the BOM is set up. Select the Column Information tab. 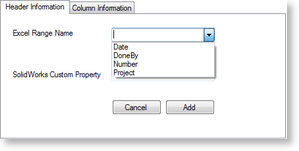 Select Add and enter a name for the column in the Name field. This will not be exported into the BOM, the template must have it's own column header if required. Select the Column Number the information is to be exported into from the Column Number field. Repeat steps 2 to 5 for all other details required to be exported into the columns. Once the plugin has completed compiling all the data for the clone, it will send it to a new Excel file (Based on your template) that is then saved into the same folder as the newly created Assembly. Open the captured master assembly in SOLIDWORKS. This is the model(s) added to the Edit Model List above. Capture a custom property named BOMFileName. See Custom Properties for more information. Open the project that drives the master model(s) in DriveWorks Administrator. Go to Stage 4: Output Rules > Model Rules and display the captured parameters for the master model. Build a rule for the custom property BOMFileName that results in the full file path, name and extension for the BOM that is created.